Tee off onto a combination of old- and new-style fairway layouts on this 27-hole course. Promotional value expires Jun 1, 2019. Amount paid never expires. Tee times required. Gilbertsville Golf Course strictly enforces a dress code, only ”Golf Attire” will be permitted at all times on the premises. Subject to availability. Limit 1 per person, may buy 1 additional as gift(s). Must use promotional value in 1 visit(s). Not valid with other offers or promotions. Merchant is solely responsible to purchasers for the care and quality of the advertised goods and services. Gilbertsville Golf Club is good at taking two things and unifying them. 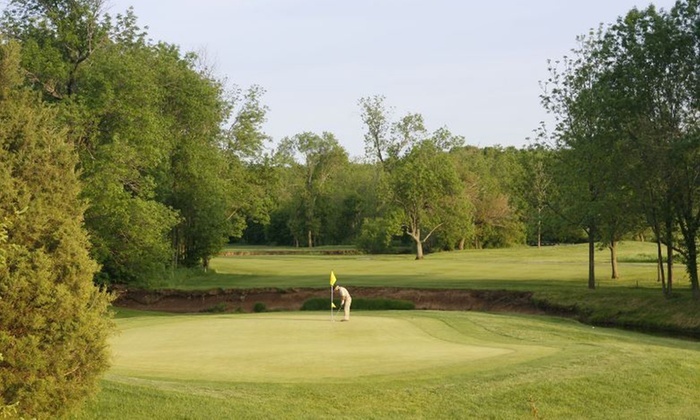 The 27-hole course, for example, takes a bit of old and a bit of new: the older red and white courses feature traditional small flat greens and tree-lined fairways, while the more modern blue course challenges golfers with its large, undulating greens. Then there’s the feel of the course itself. A public golf course that has the vibe of a private club, its dress code gives golfers an excuse to don their best fairway fashions.